Did the title of my post have you wondering what I was up to? I am very proud to let you know that one of my garden photos has been selected by 'Northern Gardener' magazine for the cover of their July/August issue! That beautiful plant with the ruffled pink flowers grows in my garden and is called Sidalcea 'Party Girl' (also known as Prairie Mallow, Checker Mallow or False Mallow). 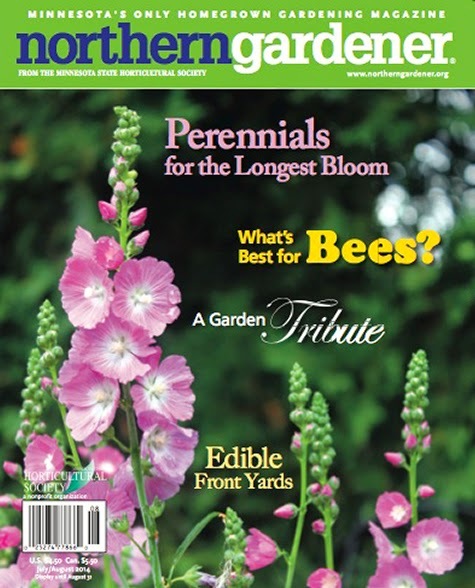 My photo was chosen to illustrate their article on long-blooming perennials. I planted it fourteen years ago in our back flowerbed and it flowers reliably and beautifully each summer. It provides lovely cut flowers too. A beautiful perennial that requires very little care. So proud that one of my backyard plants has made the big time! :) Thank you, Northern Gardener magazine, for selecting my photo for your issue. You can read their blog post about the upcoming issue here. I've written here before about how hard it is to let go of originals. There is an emotional tie that I feel with each painting. Despite this, I am starting to list more originals in my Etsy shop. Above are four of my most recent additions. I am proud of all of them. I am hoping that they find owners who will appreciate and enjoy them. I've done a lot of thinking lately about my pricing. I used to sell a lot of original watercolours fifteen to twenty years ago. I took part in a lot of the big gift trade shows with my Florescence card line and people would often ask if they could buy originals. My prices used to start at $75 and go up to about $300. I worked predominantly in miniature format in those days. Although tiny, there were hours and days invested in each painting. I now paint in bigger sizes (often 5" x 7" or 8" x 10"; I worked on a 22 x 15 inch painting this past week!). Because of the careful way I layer my colours and the detailed way I paint, all of my paintings take me hours and most often days. Yet when I started listing my originals on Etsy, I was pricing them lower than my small paintings twenty years ago. Why? I think I was influenced by the pricing I was seeing by some artists on Etsy. I wanted to make my paintings competitive with them. But instead of choosing more expensive pricing on Etsy as my model (it's there), I looked at the less expensive works. 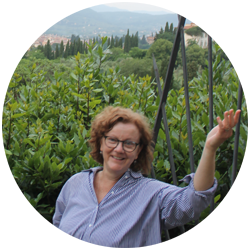 I also think that because of the gap years when I hadn't painted and was a full-time mom, I had lost confidence. I would have been better off choosing my own former pricing scale as my model. In the end, I wasn't honouring myself or my art. I recently had a business contact ask me what my current hourly rate is. It was a sobering process to think about it as I realized the way I was pricing some of my paintings, I wasn't even making minimum wage. I did a lot of reading about the pricing of artwork. There is one interesting article outlining different methods here. Some people calculate by size, others by time, some by the current market, others by the subject and medium. Rather than hoarding my art in a painting drawer in my studio, I am trying to put more up for sale. I increased the prices on some paintings that were already listed in my shop. (There are still a few under $75.) 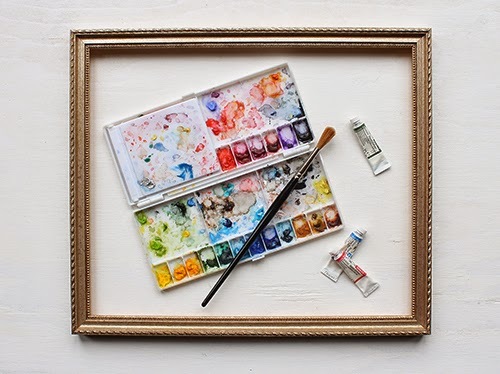 For the most recent paintings I listed, I tried to choose prices that are more in keeping with the beautiful materials I use and the time I invest in my paintings--the heart and soul that I pour into each of them. In the end, my method is a bit of a mix. One 5 x 7 painting might take me longer than another because the composition is more complex or there are more details. Sometimes a painting is bigger or the paper I use is more expensive. Sometimes, a painting is just more important to me. I hope to list more original paintings in the next few weeks. I will continue to try and choose prices that are respectful to me and also accessible to those who love my work. Yes, sometimes the painting process can be challenging but I think pricing is the most complicated part of being an artist. 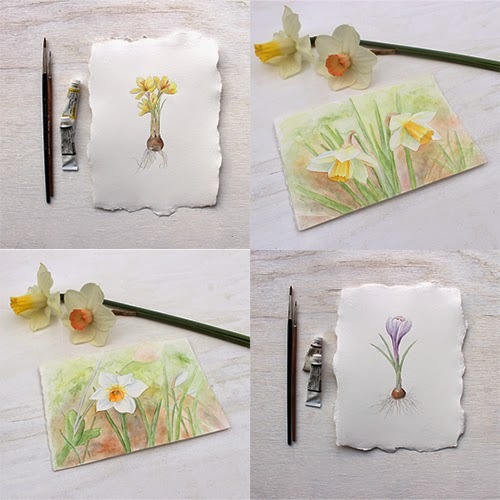 I have added a 'button' at the right side of the blog that you can click to go directly to the original paintings currently listed in my shop. There is a backstory to the photo I created for it. I had the frame and palette set up on a board on the floor. I originally tried using a tripod but the tripod was casting shadows into the photo. So instead, I leaned over it to get the picture frame 'square' in the photo. I leaned over it for so long (I took several photos and it still isn't perfect) that I put my back out. Yes, a true back story. Ouch! So I am not gardening this weekend as planned. I am doing what I can while sitting down and resting. Perfect time for a new blog post. This past Sunday, it was Emma's 19th birthday. This was the cake I made for her. 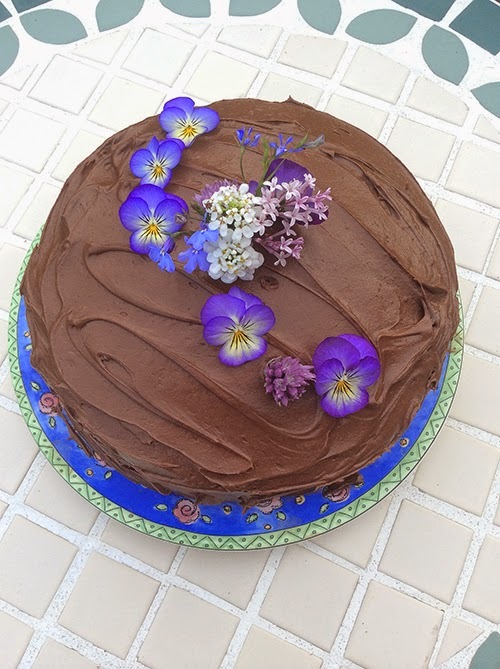 I have made this sour cream chocolate cake for special occasions for the past 30 years or so. It has been kitchen tested over and over again. When Emma was a baby, she had a severe egg allergy. Because I couldn't include eggs in recipes, her first cakes were quite flat. I think I cried when I made her cake for her first birthday. So silly of me, but it didn't match in my head what my first cake for my little girl would be. By the time she was three, she was no longer allergic (it is one of the rare food allergies that children can grow out of) and I was able to make traditional birthday cakes for her. What can I say? I am a birthday cake person. If I don't have a traditional layer cake, I don't feel like I've had my birthday. I can't remember how many times I've made this cake for family occasions but the splattered state of my recipe cards tell a tale. Melt chocolate in a small bowl over hot water (or carefully in the microwave). Cool. Grease and flour two 9" round cake pans or line them with parchment paper. Sift flour, baking soda and salt into a bowl or on wax paper. Beat the butter until it is soft in a large bowl. (I use my KitchenAid mixer.) Add the brown sugar and eggs. Beat at high speed until light and fluffy--about five minutes. Beat in vanilla and the cooled, melted chocolate. Stir in the dry ingredients alternately with the sour cream (about a third at a time, ending with the sour cream). Incorporate well after each addition and mix until batter is smooth. This next part breaks your heart a little bit as you will see your lovely thick mixture become quite thin but, trust me, it works. Stir in the cup of boiling water and mix carefully. Pour into the cake pans and bake for 35 minutes. Combine the chocolate and butter in a heavy saucepan over low heat (or heat carefully in a microwave). Remove and let cool. Combine the icing sugar, milk and vanilla in a medium size bowl. Stir until smooth. (I use my KitchenAid mixer on low speed.) Add the chocolate mixture and mix well. Let it sit for a while and it will thicken. If you are in a hurry, you can put the bowl in the refrigerator and check it every now and then to see if it is thick enough to spread. We also went through a few years of making Nigella Lawson's Buttermilk Birthday Cake (from 'How to Be a Domestic Goddess')--also a winner. My recipe book falls open to that page. Do you have a favourite recipe for birthday cakes?